NIA CHARLESTOWN NEVIS (OCTOBER 01, 2015) — The following is a press release from the Ministry of Foreign Affairs. Foreign Affairs Minister Hon. Mark Brantley and Ambassador to the United Nations His Excellency Sam Condor, are in New York representing St. Kitts and Nevis at high level meetings during the 70th session of the United Nations General Assembly. 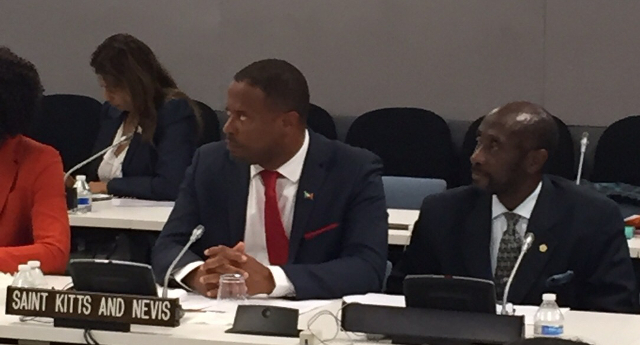 On September 29, 2015, the St. Kitts and Nevis diplomats attended the Council for Foreign and Community Relations (COFCOR) special meeting, where a wide range of issues impacting the Caribbean region were discussed. Among the critical topics were the outcome of the 2015 development summits and conferences, updates on Belize-Guatemala relations, updates on the Dominican Republic-Haiti citizenship dispute, Climate Change and United Nations Security Reform. Of particular interest to the St. Kitts-Nevis delegation was the discussion on the European Union’s blacklisting of several Caricom countries including the Federation. The COFCOR also used the opportunity to interact with and hear from high-level delegations from Georgia and the Netherlands. Minister Brantley has advised that St. Kitts and Nevis continues to engage meaningfully at all levels with international partners to advance the interests of the people of St. Kitts and Nevis.